When you have big brothers, you probably get bullied as well as pampered. This is what we ate yesterday. Big brothers : That? That is call brain-brain. 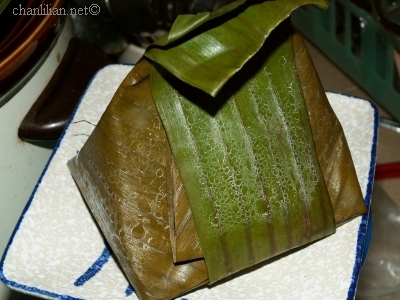 Mommy : It is otak-otak. Mommy : HOI! Don’t traumatise your little brother, ok? Don’t listen to your brothers. It is fish and coconut milk. They cook with some nice things. See? Mommy eat. Nice…. 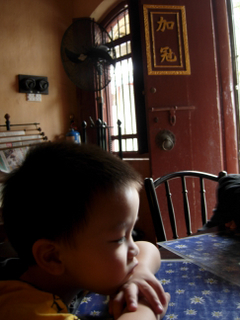 Little boy : Yeah lah, like nasi lemak like that. Kor-kor all bluffed one. Stuuuuuupiggggg. Previous Previous post: oOOOOOooo..Your silence is scaring me! Next Next post: Bloggers ‘R’ pondans (gays), now. How come the iTalk ads not showing liao? Left only the green background, not chan with you pink theme lah. I love otak otak. The best ones are from MUAR. 30 minutes away from Melaka. Most will think they are made from fishes’ brains and spare parts. But they are actually made from fish meat and shrimps. my friend once pronouced it as “ohta-ohta”. we laughed till kee siao. my birthday also coming up, u sing song for me? Hahaha, I always tipu my little brother also. It’s nice to see how the younger kids react when they were teased. My birthday coming too! Brings back memories on how my sis and I will gang up to trick our youngest sister. chinese mushrooms are little turtles. broccolis are actually trees from land of little people. sweet peas in pods are transformation of naughty brothers. My family used to travel to Muar for otak-otak weekly last time. 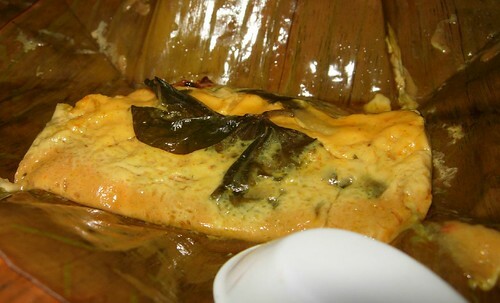 Tried penang large brain-brain too….wherever it came from, i love them all…..oh yes, Kuantan otak-otak….it is soooo different from the one we had. Next time must post!